This salad can be served cold or hot and can be enjoyed for a light lunch or dinner. It is easy to double the quantities, and feel free to top with some prawns or sliced steak. Start by finely slicing the peppers, onion and cabbage and put aside. Finely chop the red chilli and spring onions into rings, set aside and leave half for garnish. Combine all the ingredients for the dressing into a small bowl and whisk to combine, it might split at first but just keep on mixing until thick and creamy. In a frying pan, melt a little coconut oil and then lightly sweat the onions, peppers, carrot, cabbage and half the spring onions until they start to become tender. If you prefer you don’t even have to cook these and just leave it raw in the salad. Boil a pan of water, add the soba noodles and the mangetout and boil for 5 minutes until cooked, then refresh under cold water into a sieve and set aside. In a large bowl, add the drained noodles, pour in the dressing and combine thoroughly, then slowly add the vegetables, half the coriander, half the crushed peanuts and half the chilli and toss together. 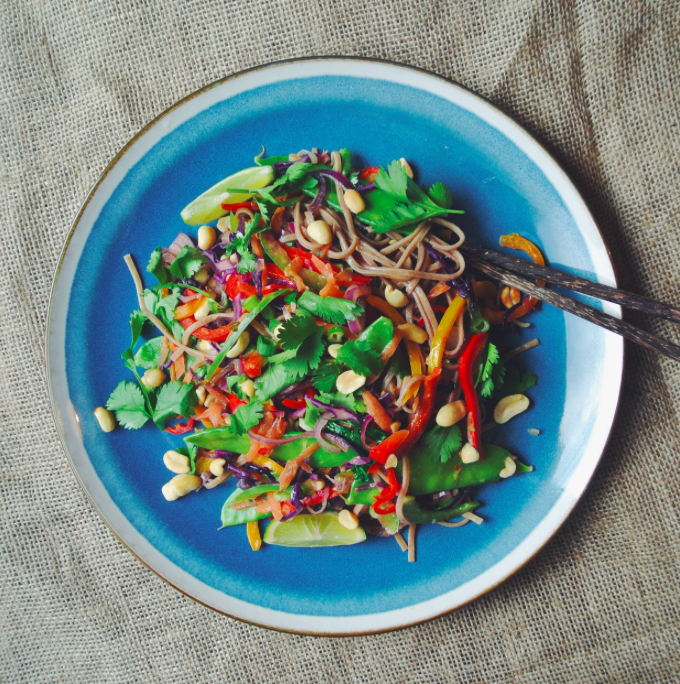 Serve the noodles on a plate with a squeeze of lime and then sprinkle the rest of the peanuts, the coriander, chilli and spring onion on top to your liking.